For a film to announce itself with such a knowingly outlandish title, you’d be forgiven for thinking that The Man Who Killed Hitler and Then the Bigfoot was deliberately baiting that midnight movie-type audience. 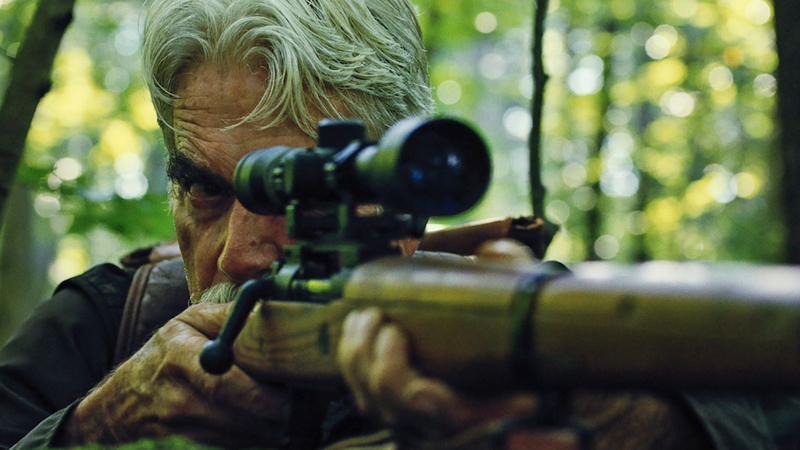 You only need to see the wistful gaze of the great Sam Elliott – sat propping up a bar in the film’s opening scene – to know that, while resolutely offbeat, this is a surprisingly muted and contemplative affair than the mouthful of a title suggests. It’s also the second film in a row (following last year’s A Star is Born) where we get to see the usually stoic Elliott reveal a more vulnerable side to his alpha cinematic persona – he openly weeps during one moment – and his performance is all the better for it. Elliott plays Calvin Barr, a retired and unheralded American hero who now whiles away his time in retirement living a largely mundane existence, forever reminiscing about his titular assassination and heroic adventures in Germany during the Second World War (he’s played in flashback throughout by Poldark hunk Aidan Turner) and lamenting the girl who got away (Caitlin FitzGerald). He’s visited out of the blue one day by government agents who enlist him on a mission to hunt and kill the fabled Bigfoot, who is alive and well and happens to be the carrier of a devastating plague – which Barr is invulnerable to – that has the potential to wipe out all of humanity. Director Robert D. Krzykowski (who also wrote the script) has crafted a compelling and largely original picture here, which trades in a little of that contemplative poignancy as seen in Harry Dean Stanton penultimate film Lucky, coupled with the absurdist flights of fancy found in The Hundred-Year-Old Man Who Climbed Out the Window and Disappeared. Something remotely resembling a plot occurs 40 minutes in when Barr is offered his fantastical assignment, and from there the film shifts into a brief but excitingly-staged survivalist thriller, before segueing back into a slice of small town whimsy (complete with a syrupy John Williams-esque score). This tonal leap certainly tests the elasticity of the medium, yet somehow not only does it all hold together, it never really jars. Much of this has to be attributed to Elliott’s commanding and assured performance which sells every aspect, be it the quieter and grounded moments or those inherently fanciful interludes. The actor is full of grace, oozes gravitas and also plays it utterly straight throughout. It isn’t too much of a stretch to proclaim this, alongside Bradley Cooper’s aforementioned directorial debut, as a career highpoint. Allotted only the briefest of theatrical windows (it’s available to stream after the weekend), The Man Who Killed Hitler and Then the Bigfoot is a thoroughly enjoyable and sneakily touching oddity which is entirely worthy of a big screen outing.